Schedule easy recurring emails and reminders from your inbox. Boomerang for Gmail is a Firefox/Chrome plugin that lets you schedule recurring emails and reminders from your inbox. Just downloaded Boomerang for Gmail. Thank you Baydin. This is life changing. 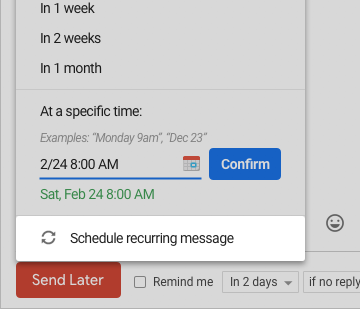 Boomerang for Gmail makes it a snap for you to schedule a recurring message. 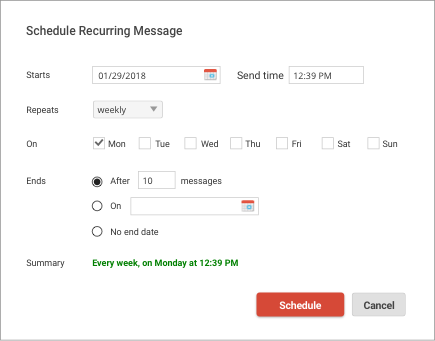 You can simply draft an email as you normally would, then click ‘Schedule Recurring Message’ from the bottom of the Send Later menu. From the menu, you can choose when you want the messages to be sent. It’s that simple!